1. The seconds preceding this frame show Sandy and Jeffrey in the hallway outside Dorothy’s apartment, embracing, kissing, the shot slowly blowing out to blinding white before fading back into this shot, a close-up of Jeffrey’s ear as he lays dozing (dreaming?) on a lounge chair in his parents’ back yard. 2. The black frame, from earlier, as balance. 3. Is Jeffrey emerging from the dream that has been the film? 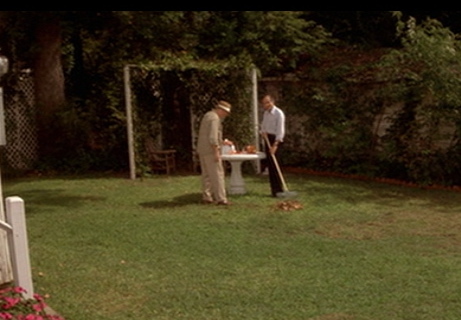 When Jeffrey awakes in his lawn chair in his back yard, for instance, his recovered father seems to be played no longer by Jack Harvey, but Jack Nance instead (Paul, from Frank’s gang) who even wears a hat that resembles Paul’s. It’s difficult to tell, from the distance of Jeffrey’s perspective, although in addition to the hat the voice sounds like Nance’s. But it doesn’t really matter, because we remember him as being Jeffrey’s father from earlier, and even if he’s not—even the fact that the father is played by one actor in Jeffrey’s extended dream and another actor when he wakes—this doesn’t change anything at all about what happens in the film. The film itself is a fiction, an illusion (except when it’s not; i.e., it’s a documentary in the sense that all live-action films involve the documentation of the on-set reality, the actors, the props, etc.) so that the whole “dream within the film” is already part of the dream-logic of the framing film. 4. The white light brings Jeffrey back into the mythic Reagan era. Family. Generational bonding. Green lawns. Dinnertime. Custom. Tradition. Courtship. Daylight. Order. And despite the pressures of our modern world, family and community remain the moral core of our society, guardians of our values and hopes for the future. Family and community are the costars of this great American comeback. They are why we say tonight: Private values must be at the heart of public policies. there’s no guarantee whatever for what our memory tells us. But I’ll gladly concede that the scene [the childhood memory in question] is genuine. . . . Such a memory, whose value consists in the fact that it represents thoughts and impressions from a later period and that its content is connected with these by links of a symbolic or similar nature, is what I would call a screen memory. The term “screen” from the title works in two ways, referring both to memories that are screened or covered (and in fact the German term Freud uses, Deckerinnerungen, can also be translated as “cover memories” according to translator David McLintock) as well as to memories that we project onto a mental screen. The essay was published in 1899, four years after the Lumière brothers first projected their films on a screen. 7. Up close like this, Jeffrey’s ear could be anything, any landscape bathed in sun, and in frames like this it’s as if the real detective in the film is the camera itself, getting so close to reality with its lens that it becomes, as it must be and shall remain, a mystery. Over the period of one full year — three days per week — The Blue Velvet Project will seize a frame every 47 seconds of David Lynch’s classic to explore. These posts will run until second 7,200 in August 2012. For a complete archive of the project, click here. And here is the introduction to the project.